Dwayne Johnson | No Chic. Just Geek. Well, thank heavens for that: the football is over at last, meaning the ever-cautious film studios are willing to release some properly sizable films once more. (Although I note that the first two really big releases are movies aimed either at a family audience, or the more feminine echelon of the cinema-going public.) Amongst this number we should probably include Rawson Marshall Thurber’s Skyscraper, which naturally concerns a sturdy, towering edifice, or Dwayne Johnson, as he prefers to be known. This time around genial Dwayne plays Will Sawyer, an ex-Marine, ex-FBI agent security consultant, who as the story proper gets going is in Hong Kong with his family – his wife (Neve Campbell) being an ex-military doctor who happened to steal Dwayne’s heart, round about the same time she was also amputating his leg (sometimes a hostage rescue goes a bit sideways – we shall return to the curious issue of genial Dwayne Johnson’s artificial leg later on). Why are the Sawyers there? Well, tycoon Zhao (Chin Han, who has been playing sleekly powerful Chinese dudes in Hollywood movies for a good ten years now) is just finishing up his latest project, the tallest building in the history of tallness, and needs someone to do a security and safety assessment so he can get it insured. And Dwayne’s the man for the job! It’s not all that long since genial Dwayne’s last vehicle, the rather jolly (if somewhat weird) Rampage, was in theatres worldwide, so you could certainly argue that the big lad is risking overexposure by releasing another movie quite so soon – especially when there is nothing especially distinctive or remarkable about the movie. I mean, there’s very little that’s actually wrong with Skyscraper, it’s competently plotted, scripted, written, directed and played, and you can see where every penny of the budget went (the clue is in the title). It’s just that the whole enterprise feels very soulless and calculated. As long-term readers know, I generally feel those lazy ‘this film is X meets Y’ descriptions are the work of Satan, but in this case it’s almost impossible to write about Skyscraper in any detail without saying that this is basically a remake of Die Hard with a hefty dollop of The Towering Inferno thrown into the mix, right down to the European villain (though it goes without saying that Moller (O with a line through it) is not even playing the same game as Alan Rickman, let alone appearing in the same ballpark). Many of the other decisions seem to have been influenced solely by the desire to make the film as profitable as possible – it’s very common now for sensible would-be blockbusters to attempt to crack the ultra-lucrative Asian market by including actors and locations from that neck of the woods, and this is doubtless the reason for the film to be set in Hong Kong and have a largely-Chinese supporting cast. 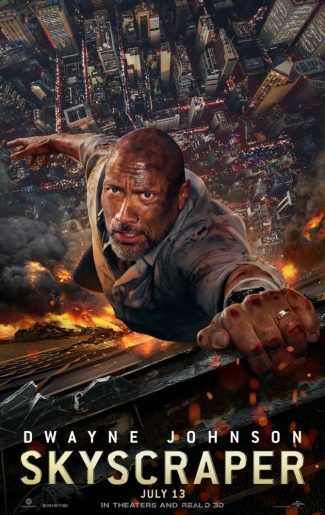 The film’s credentials as a proper action thriller are meanwhile undermined by a distinctly discernible attempt to make this another family-oriented film: there’s a lot of attention paid to Dwayne’s plucky wife and adorable kids, and while there’s still a degree of our hero hitting people with axes, throwing them out of burning buildings, and generally putting the beat-down on the deserving wicked, the emphasis is always on how much he loves his wife and kids and just what he’ll put himself through in order to protect them. Which is, you know, a perfectly commendable sentiment, but it just feels like it’s here to tick a box. This is that sort of script: it feels like it was written by software, or at least using some sort of spreadsheet, with all the key exposition inserted in precisely plotted locations, and key plot points appearing exactly where screenwriting dogma dictates – once again, there’s nothing particularly wrong with that, but it feels like everything remotely quirky or distinctive about Skyscraper has been ruthlessly winnowed out in case the Average Cinema-goer doesn’t like it. The only thing which is a little bit odd about the film is all the business with Dwayne Johnson’s prosthetic leg. I’ve seen one review of Skyscraper suggesting that the film is in slightly bad taste for featuring a burning high-rise structure only a year or so after the Grenfell Tower fire – honestly, I’m not sure the two scenarios really have enough in common for that to be an issue. However, I do think there may be something a little bit off about casting Dwayne Johnson as an amputee – although I suppose that, if Dustin Hoffman can win awards for playing someone with autism, we shouldn’t be sniffy about letting Johnson play someone with one leg. You’re never far from a reminder of Johnson’s leg in this film, and the script is at least inventive in how it manages this. Dwayne’s first big fight sequence is made to seem less one-sided than usual (let’s face it, all of Johnson’s fights seem a bit one-sided, unless he’s taking on Vin Diesel or Jason Statham or Godzilla) when the bad guy steals his leg (Johnson is – wait for it – hopping mad). Later on the leg proves invaluable in jamming open doors and suchlike. How I Learned to Stop Worrying and Love My Prosthetic Leg would be a good subtitle for this movie. Johnson and the rest of the cast are clearly trying hard throughout Skyscraper, and – as I have suggested – the rest of it is at least competently put together. The problem is not just that it never really rises above the level of functional competency, but that it doesn’t really want to. It will not really surprise or engage you in any but the most superficial way. Not an actually bad movie, but simply very bland. They’re not doing a Fast and Furious film this year, thus freeing up genial Dwayne to make another film instead, and his choice has turned out to be Brad Peyton’s Rampage. While I was buying my ticket for this movie, I noticed one of the ticketeers struggling to deal with a young mother who’d brought her kids to the cinema. The rictus mask of horror which settled upon the face of the young mum is not something I can easily describe, but I think it’s safe to say that Rampage did not receive her custom. This is a shame, for Rampage is pretty much the perfect Dwayne Johnson vehicle – big, slightly absurd, but essentially good-natured and very likeable. I must confess to having simplified the plot a bit when I was pitching the movie to the lady in the cinema. It says something about Rampage that genial Dwayne plays a crack special forces soldier turned brilliant primatologist, and yet this is very far from the most preposterous thing that the film requires you to believe. Well, anyway, the film is predicated on the fact that ‘genetic editing’ technology exists allowing unprincipled scientists to basically mash up different kinds of animal. Some experiments along these lines have been taking place on a space station, which as a result is experiencing an infestation of Rodents of Unusual Size (this sequence kind of resembles a gonzo remake of Gravity). Needless to say things go badly and cannisters of the (very vaguely defined) monster-animal-creating jollop fall to Earth in various locations across America. The principal one of these, from our point of view, is the zoo to which Dr Davis Okoye (genial Dwayne) is attached. Davis likes animals more than people, on the whole, and his special friend is George, an albino gorilla. So he is as cross as two sticks when exposure to the falling space debris results in his pal growing two feet in height in a matter of hours and becoming uncharacteristically violent and aggressive. Other people have more serious problems. The evil corporate types responsible for the whole mess, the Wydens (played with cartoon gusto by Malin Ackerman and Jake Lacy), need to get a sample of the jollop in order to shore up their stock price, so they pack a team of mercenaries off to Montana to find another one of the cannisters. But they all end up getting eaten by a wolf the size of a bus. So, as you would expect from people who think that creating giant mutated near-indestructible monster animals makes good business sense, they hit upon an equally sensible plan B: sending a radio signal from the roof of their skyscraper in Chicago which will attract the monster animals to the city, thus allowing the armed forces to kill them all (and letting the Wydens get their sample). 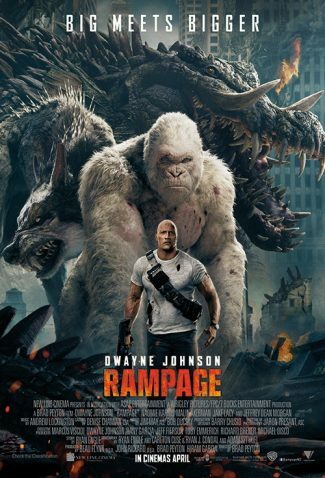 If I say they do a pretty good job with some unpromising material (it took four people to write this thing), this is not because I am claiming that Rampage is a film of great moment which will long be remembered as a significant contribution to world cinema. It is not. It is a film about Dwayne Johnson having a fight with a giant albino gorilla, a giant mutated crocodile, and a giant wolf-porcupine-flying-squirrel hybrid. But as such, the movie knows exactly when the audience will probably cut it some slack (yeah, so the monster animals can home in on radio signals…) and when it really has to deliver – namely, in the scenes of the monsters running amok in Chicago and fighting the armed forces. I don’t know, maybe we’re living through a new golden age of the American monster movie and we didn’t even notice it start – in the last year or so, there’s been Skull Island, Pacific Rim: Uprising, and now this, all of which have captured the energy and fun of classic monster movies much more than things from even four or five years ago. The original Rampage game clearly owed a debt to King Kong and Godzilla, of course, so there’s a sense in which the circle is closed here – it also seemed to me that the croc in this movie bears something of a resemblence to a classic Toho monster. The shade of Ishiro Honda would surely approve of the various sequences of urban devastation which make up the bulk of the third act of the movie. However, I think we are in danger of overlooking the contribution made by the actors to this film. It’s true that the villains are just there as plot devices, and they are essentially ciphers, and it’s equally true that no matter how hard New Line Cinema push for an Oscar nomination for genial Dwayne, he ain’t gonna get one for this movie – but he and Harris and Morgan do an essential job in putting a human face on all the CGI, and giving the film a bit of warmth and humour and even soul (Johnson’s range obviously has its limits, but within those limits he’s a very effective performer). Even when the film is at its most over-the-top, there will be a little moment of knowing humour, just to reassure you that the film is entirely aware of how preposterous it is, and I can’t describe how relaxing this feels. It’s fair to say that the only award Rampage is likely to win is Popcorniest Popcorn Movie of the Year (emphasis on the corny) – unless they introduce an Oscar for best flying CGI wolf, anyway. I am also very sure that this is the kind of film that many people would run a mile rather than go anywhere near. But as a bonkers monster movie, it is simply a huge amount of fun. It is probably the most ridiculous thing that will appear in cinemas this year – but ridiculous doesn’t necessarily mean bad. When you go to the cinema as often as I do, one of the resulting perks is that your accumulated loyalty points earn you a free ticket that little bit more often. This brings with it an important philosophical question – namely, is it more satisfying when your free ticket takes you in to see a truly great movie, meaning you’ve had a fantastic time gratis? Or is it better when the freebie turns out to be for a complete yapper, meaning you at least haven’t had to pay to watch a really bad film? Which brings us to Brad Peyton’s San Andreas, the most recent film I managed to snag a free ticket for. Now, while Spanish-speaking readers may be wondering if this is a film about a golf course outside Edinburgh, most other people will rightly assume this is going to be a story concerning earthquakes and how best to prosper during and immediately after them. San Andreas‘ top tip seems to be ‘find something sturdy and hang onto it’, which is probably why it stars Dwayne Johnson, surely the – er – sturdiest leading man in Hollywood. Sometimes he’s so sturdy he’s practically immobile. Anyway, this time round Dwayne plays Ray Gaines, an enormous rescue helicopter pilot working for the LA fire department, following an illustrious career in Afghanistan (etc, etc). However, Dwayne is struggling with some personal angst, which has led to his wife (Carla Gugino) filing divorce papers and planning to shack up with a rich but worthless property tycoon who you just know is going to let everybody down quite badly when the crunch arrives (Ioan Gruffudd). Now, you and I both know that when someone gets sent divorce papers at the start of a film, this is a flag to the effect that the film is going to be about their reconciliation and a second chance for their family, and so it proves here: there are a lot of special effects and things going bang (crash, crunch, tinkle, etc) in San Andreas, but the main thrust of the film is ultimately about Dwayne and his wife getting back together, not to mention his comely daughter (Alexandra Daddario) finding a nicely non-threatening boyfriend. It just so happens that the piquant backdrop to all this is one of colossal devastation with nameless other characters being mown down horribly by the truckload – but as they have no connection to the Rock family, we are encouraged not to care about them, rather to just enjoy the spectacle of their lovingly-rendered deaths. Or, to put it another way, this is another Roland Emmerich disaster movie pastiche. Emmerich has never been a particularly lauded or cool director, but in films like Independence Day, The Day After Tomorrow, and 2012, he did at least manage to reinvent the disaster movie formula in a way that had a certain lightness of touch and tongue-in-cheek quality, and while those films may have been cheesy and absurd, they were also very entertaining. 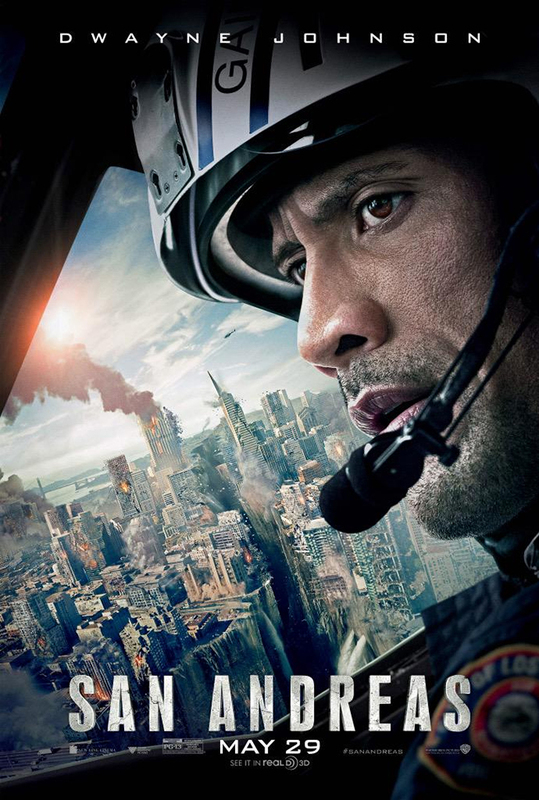 San Andreas is just grindingly earnest and more than a bit annoying as a result. You find yourself noticing things like the way the Rock family cheerfully loot everything in sight – boats, cars, shops, planes, fire appliances – and questioning the film’s assumption that it’s perfectly acceptable for a hugely experienced First Responder to basically walk out on his duties and put his family’s interests ahead of those of the public he’s actually supposed to be serving. If the film acknowledged even slightly how improbable and laboured (and yet also, somehow, obvious) its plotting was, that might make it more acceptable: but it doesn’t, which somehow makes it worse. San Andreas is a classically modern movie in that the whole enterprise is built around lavish special effects the like of which didn’t exist even twenty-five years ago. Back in ye olden days, films couldn’t just rely on empty CGI spectacle, and so they had to worry about things like engaging characters, innovative plots and interesting dialogue. What San Andreas repeatedly proves is that you can have all the wibbly-wobbly skyscrapers, burning buildings, collapsing bridges, and Kylie Minogue cameos you want, but if you use them as a subsitute for those old-fashioned narrative virtues rather than a supplement to them, you’re going to end up with something which is pretty to look at but ultimately rather uninvolving (this happens in the first few minutes, when a character we barely know has a spectacular, visually striking car crash and you find yourself thinking ‘Why should I care, particularly?’). Give the Rock some credit, he takes a fair swing at some of the more emotional moments in the script, and the results are not exactly painful to watch. I expect most of the people involved in this film will work again, because it will probably make money: this film most likely scrapes into the ‘too big to fail’ category. But the story just isn’t good enough – it’s predictable and silly from the first scene to the last. Watching horrific natural disasters shouldn’t be fun, but somehow it is when watching a well-done disaster movie. This isn’t a well-done disaster movie, nor is it very much fun. So, I was in the pub the other afternoon, catching up with a friend: a woman of impressive wit and intelligence, no small measure of physical beauty, and (regrettably) impeccable taste when it comes to romantic entanglements. ‘Have you seen any really crap films recently?’ she asked, fully aware, like most who know me well, that when not working or actually asleep I spend most of my time in front of a screen of some description. I had to think about that for a bit, and realised I had actually been enjoying a pretty decent run so far this year: a few disappointments, but nothing actually traumatically bad. ‘But,’ I added, ‘I am going to see Fast & Furious 6 tomorrow.’ I filled her in on what I gathered to be the general tone, plot, and content of the film. I think I’ve mentioned already that Cocktail is her favourite film. 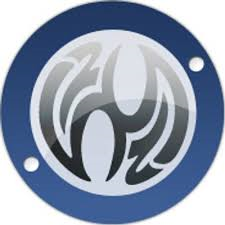 Hey ho. Well, for the purposes of answering her question, I have to say that I can’t honestly describe Fast & Furious 6 (directed, like number 5, by Justin Lin) as a really crap film. I am aware that in doing so I may be using a different qualitative scale to the one traditionally employed on the planet Earth, but so be it. Gravelly-voiced boy racer/criminal mastermind Dominic Toretto (the great Vin Diesel), together with his extended family of morally-flexible motorheads, has relocated to the Canary Islands to live off his ill-gotten gains. 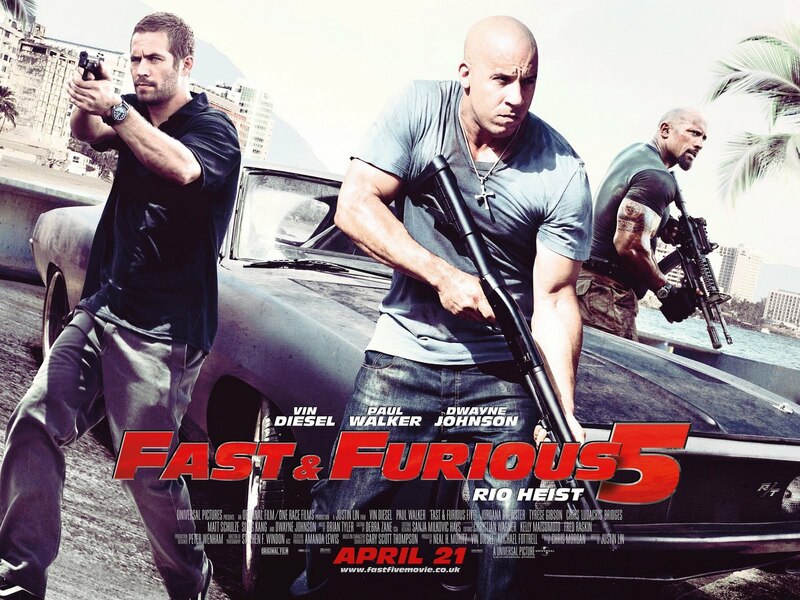 The film opens with a classic Dumb Movie Bit where Diesel and his rather drab sidekick (Paul Walker) have some dialogue stressing that they have Moved On With Their Lives and the days of constant hazard and adventure are Well And Truly Over. You know this scene has only been included because they are going to go back to their lives of constant hazard and adventure about four minutes later. And so it proves, as slightly ridiculous colossus of justice Hobbs (The Rock (Dwayne Johnson)), acting on information battered out of a suspect in Moscow, recruits Diesel to help him catch criminal mastermind Owen Shaw (Luke Evans), who used to be in the boy racer division of the SAS. The carrot to get Diesel on board is the presence on Shaw’s team of his old flame Letty (Michelle Rodriguez), who everyone thought was dead and is, in any case, suffering from Movie Amnesia. And so it proves. Very elderly readers may recall the original The Fast and the Furious starring Diesel, which came out in 2001 and was a fairly gritty (if slightly glitzy) thriller about the illegal street racing scene and the subversive glamour of a life of crime. Fast & Furious 6, on the other hand, is… well, look, it’s got to the point where they sit around thinking up stunt sequences and then write the script around them (apparently the climax of this film is a stunt they’ve been trying to think of a way to include since number 4). It basically goes a little something like this: Vroom vroom. Discussion about FAMILY. Exposition. Exposition. Comic relief. Fistfight. Comic relief. Vroom vroom. Exposition. Discussion of differential tranmissions. FAMILY. Comic relief. Comic relief. FAMILY. Vroom vroom. Explosion. Fist fight. Comic relief. Exposition. FAMILY. Vroom vroom. And so on. As you may have noticed, the big theme that is impressed upon the small section of the audience’s brains not pummelled into submission by the sound and fury on the screen concerns FAMILY, which is what Diesel and his gang of criminals have apparently decided that they are. This sort of vein of cheesy sentiment inserted into an otherwise relentless cavalcade of violence, misogyny, off-colour humour and general amorality put me rather in mind of the later Lethal Weapon movies, but this is a much bigger and brasher movie than any of those. 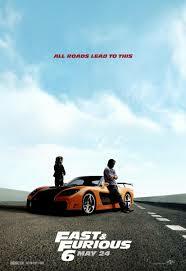 What else can I say about Fast & Furious 6? It is a highly polished, precision-built, beautiful-to-look-at machine of such vaulting absurdity it almost beggars the imagination. I really shouldn’t have enjoyed it, even ironically, and yet the fact remains that I did. In terms of big, dumb, silly, fun action movies, Fast & Furious 6 sets the standard: this is the film The Expendables wishes it could be. And … spoiler ahoy! … this is before we even come to the post-credits sequence, in which the brother of the villain sets out upon a rollicking rampage of revenge against Vin and the others. Suffice to say that when he appears, he has a baldy head, a variable accent, and a notable history of vehicular mayhem of his own: my alluring friend would not have been in the least surprised to see him. 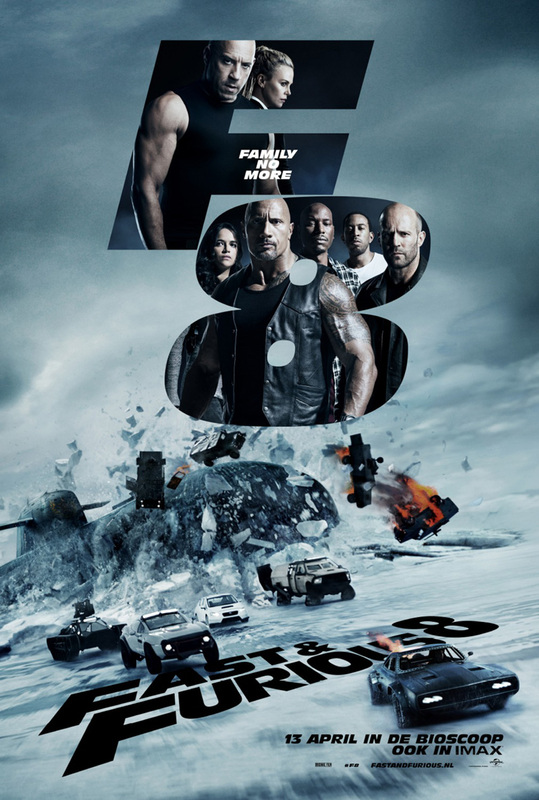 This and the previous Fast & Furious both turned out to be unreasonably good entertainment: but the next one promises to be something truly epochal. I cannot imagine any power on Earth keeping me from seeing it.